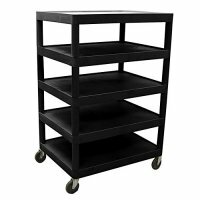 Large five shelf black supply cart with flat shelves and 4 inch swivel casters, two with locking brakes. Clearance between shelves 8". Assembly required.